Memphis Wood Fire Grills bring heavy duty stainless steel, Intelligent Temperature Control™, and direct flame capability to wood fire grilling. Experience a Memphis Wood Fire Grill in person and see what it can do. Search our certified Memphis dealer locator to find a dealer near you! Outdoor kitchens are rising in popularity, and we are ahead of the trend! Our new line of stainless steel doors and drawers complement any outdoor kitchen setting. An elegant and well-designed option for grilling enthusiasts who want an outdoor kitchen, but don't want the expense and commitment of a custom build. A Memphis Wood Fire Grill is the backyard chef’s secret weapon. It has you covered from pork chops to pies; from burgers to brisket to banana bread. By combining four separate cooking techniques (grilling, wood-fire searing, low-n-slow smoking, and convection baking), it is quite possibly the most versatile and flavor-enhancing device on the planet. Do more — a lot more — with one easy-to-use grill. Read more about how Memphis Grills are unlike any other grill you’ve ever seen. With Memphis Grills, you truly can have the outdoor kitchen you’ve been dreaming of. We offer the only built-in wood fire pellet grill on the market today! Our turnkey outdoor solution includes a built-in grill and weather-tight storage. The stainless steel and powder-coated aluminum products ensure your kitchen withstands the elements no matter where you live. And now, with our new stainless-steel drawers and doors, you can fully customize your outdoor space to match the high-end designs you have in mind. Buying a high-quality wood fire grill is a step you want to take thoughtfully. With so many options on the market, and even more options when it comes to accessories and add-ons, it only makes sense to speak with someone knowledgeable about the products. Also, working with a dealer near you allows you to see the products in person and get hands-on interaction with them before you make your purchase. Want More Flavor? Try Wood Pellet Grilling. There’s a reason the world’s most respected chefs and BBQ pitmasters cook with wood: From high-temperature searing to low-and-slow smoking, nothing enhances the flavor of your ingredients like 100% natural hardwoods. 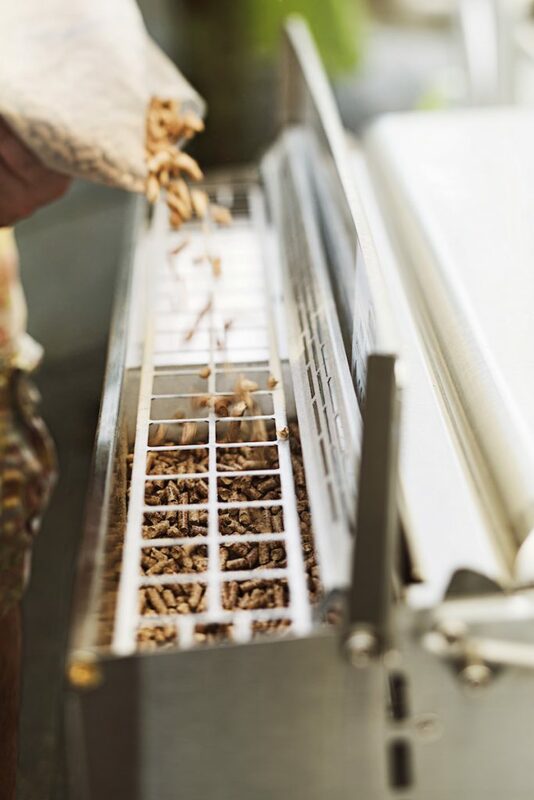 With Memphis Grills, you get to choose your wood pellets from among six hardwood flavor varieties. Our grills and BBQ smokers bring more than flavor to the table. Thanks to our high-quality stainless steel materials, your Memphis Wood Fire Grill will last you much longer than a traditional grill. All of our grills are resistant to corrosion and rust, as well as have low maintenance needs due to ease of cleaning and maintenance.